The Leonore Piano Trio revivifies three works by a figure already—and unfairly—consigned to the musical footnotes of history before he died, and yet whose music is bound to charm in such persuasive performances as these. Pixis was said to have a colossal nose that was the subject of many jokes. Heine called it ‘one of the curiosities of the musical world’. Then there was the strange encounter with Chopin when the dashing young Pole called unannounced at Pixis’ home in Stuttgart. Pixis was not at home. ‘Just imagine!’ Chopin wrote gleefully to a friend in a letter of December 1831. ‘He has with him a very pretty girl of sixteen whom, he says, he is going to marry.’ Chopin and the girl chat, Pixis returns, is furious with the girl for allowing herself to be alone with a stranger, calms down and then, worried that Chopin will be offended, subsequently goes out of his way to promote his talents—including a recommendation to the publisher Schlesinger. This led directly to the commission for the Grand Duo concertant on themes from Meyerbeer’s Robert le diable. Chopin subsequently dedicated his 1828 Fantasy on Polish Airs, Op 13, to Pixis when it was published in 1834. But was the young girl Chopin met really Pixis’ mistress? Would any even half-famous musician have lived so openly with a sixteen year old and declared his intention of marrying her? Or was it in fact his adopted daughter, Franziska Göhringer (1816-?1888), whom Chopin encountered? She would later become a famous mezzo-soprano (as Francilla Pixis) and tour widely with her father. Following her marriage in 1843 to a Sicilian nobleman, Giovanni di Sant’Onofrio del Castillo, and her subsequent retirement from the stage, Peter Pixis also retired. Whatever the truth of the matter, that, it would seem, would be that—until the last few decades when a handful of Pixis’ works have been recorded. The most notable of these is Howard Shelley’s revival of his Piano Concerto in C major, Op 100, and Piano Concertino in E flat major, Op 68 (volume 58 in Hyperion’s Romantic Piano Concerto series, CDA67915, where more of the few details we know of Pixis’ life can also be found). Having heard these two works, Pixis’ almost total obscurity was clearly unjustified and might be further called into question after hearing the three recorded here. From the late 1820s to 1845 he lived in Paris, and Pixis was counted one of the leading pianists of the day. To have been chosen by Liszt along with Thalberg, Czerny, Chopin and Herz to be one of the contributors to his Hexaméron extravaganza was some kind of recognition and badge of honour. There were many other distinguished pianists in Paris at the time who might have had the invitation, though it must be admitted that Pixis is very much to Hexaméron what Cui is to the Mighty Handful and Louis Durey to Les Six. It was in the same year as the Hexaméron performance (1837) that Liszt arranged a concert featuring two piano trios on the same programme, one by Beethoven, the other by Pixis. Owing to a mix-up with the programme, the two trios were played in reverse order. The Parisian audience, reading that they were hearing the great Beethoven, listened to the Pixis trio with evident enjoyment and applauded enthusiastically at the conclusion, proclaiming it a work of genius. Next came the Beethoven trio programmed as Pixis. The audience became restless and bored and made their feelings evident. One wonders if the same reaction could not be elicited by similar means today in certain concert venues. 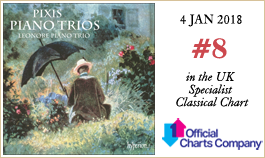 Which particular Pixis piano trio was played on that occasion is not recorded (he wrote seven), but it is entirely possible that it was the Grand Trio No 1 in E flat major, Op 75. The title page informs us that it was ‘composé et dedié à son ami J N Hummel’, who would no doubt have noted the resemblance of much of his friend’s piano writing to his own, especially in the first movement. This opens with a rhythmically catchy two-bar figure (two quavers–quaver rest–three quavers–quaver rest–quaver, repeated) that permeates the whole movement and is marked staccato. Music lovers of a certain vintage will immediately recognize this as the same figure that forms the piano accompaniment to the evocative Flanders and Swann song Slow Train. Here, however, it is marked allegro con brio and provides the springboard for a succession of ideas, a chorale-like passage providing some respite and soon leading to some highly virtuosic passagework reminiscent of the finale of Hummel’s piano quintet of 1802 (and in the same key). After the exposition repeat there is a linking passage to a fermata after which (8'28) the opening figure returns, this time in C major. Pixis takes us on a brief excursion via the key of F sharp major before returning home for a varied treatment of the opening material, ending in a scintillating coda. Above the simple folk-like theme of the second movement (andante con moto), the score informs us that it is a ‘Motif de l’oracle [sic], opéra par Pixis’, a work about which the present writer has been able to discover precisely nothing. The theme, which could easily have been penned by Schubert, is succeeded by one in a similar vein before returning to the ‘Motif de l’oracle’ with the piano providing filigree decoration, after which it subsides into a more sombre view of the tune. The movement is in B flat. A strikingly original device returns us to the work’s tonic for the finale: a twenty-bar poco adagio section for all three instruments leading to a cadenza-like sequence for piano solo. All three then dive joyously into the presto 6/8 finale, one of those helter-skelter, scampering movements which must be as fun to play as it is to hear. After a pause to catch their breath (poco adagio, 8'06), the tempo rises to prestissimo, the piano finally confirming its dominance as everyone hurtles past Pixis’ closing exhortation (il più prestissimo) to the breathless finish, surely leaving players and audience wreathed in smiles. The Piano Trio No 3 in B minor, Op 95, was published in about 1829 and dedicated ‘à son Ami Klengel’ (almost certainly the pianist and composer August Klengel, 1783-1852, who visited Paris in 1828). Fiery octaves from the piano contrasted by a gentle motif—a favourite Beethovenian device—provide the starting point for the first subject before the piano launches into a brilliant passage of triplets over which the violin sings a long-breathed phrase—a favourite device of Pixis. After the exposition repeat, the development modulates into G minor and a waltz-like theme, and thence into B major. Some dazzling play from the piano leads back into the home key for a brief dalliance with some of the opening ideas. If the first movement belongs to the piano, the two strings dominate the second (though the keyboard is kept fairly busy). The theme is a coquettish march tune (2/4 in G major), with a beguiling dotted rhythm that appears throughout the sequence of variations. The delightful scherzo is set in the rather distant key of E major, as is the trio section in which the keyboard provides rippling quaver accompaniment over long pedal notes for the strings’ enchanting theme reminiscent of Mendelssohn. Pixis’ finale is labelled ‘alla Mauresque’, that is, ‘in the style relating to (or characteristic of) the Moors’. It’s a lively, attractive (and pianistically demanding) dance movement which cannot fail to lift the spirits—and as Moorish as Mozart’s Rondo alla Turca is Turkish. It rounds off the entertaining four movements in exuberant style. 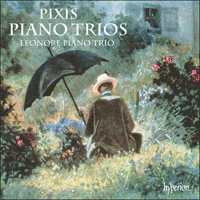 The Leonore’s final work is the three-movement Trio Concertant No 1 featuring themes from Le Colporteur, a completely forgotten opera by George Onslow (1784-1853), and written by Pixis in conjunction with ‘les frères Bohrer’. Le Colporteur ou l’Enfant du bûcheron (The Peddler or The Woodcutter’s Child), though coolly received by the critics when it was first presented at the Opéra-Comique in 1827, inspired several composers to use its themes including Friedrichs Kuhlau (Introduction and Rondo, Op 98a) and Kalkbrenner (Entr’acte et Marche). Rather in the manner of Chopin composing his Grand Duo for cello and piano in conjunction with his friend Franchomme, Pixis wrote his trio in collaboration with the Bohrer Brothers: Anton (1783-1852) was a violinist who toured successfully throughout Europe with his cellist brother Max (1785-1867). The trio follows a straightforward pattern. After the introduction, the strings play Onslow’s unassuming theme, followed by the first two variations. One hears at once how much more eventful and demanding is the string writing than in the two piano trios where the keyboard dominates. Here it underpins, acting principally as accompanist—until, that is, variation three (3'15) when Pixis takes over with a brillante couple of pages. Following that comes the highly original fourth variation in which all three instruments play pianissimo, the violin and cello sempre pizzicato, the piano sempre staccato. Having moved from G major for the introduction to D major for the variations, the music now shifts briefly into E flat major for the 6/8 introduction to the concluding allegro (in G major), in which musical honours are shared, a convivial example of genuine musical liberté, égalité and fraternité. On disait de Pixis qu’il avait un nez colossal qui fit l’objet de nombreuses plaisanteries. Heine en parlait comme de «l’une des curiosités du monde musical». Il y eut ensuite l’étrange rencontre avec Chopin, où le jeune et fringant Polonais passa sans prévenir chez Pixis à Stuttgart. Pixis n’était pas chez lui. «Vous vous imaginez!», écrivit Chopin en jubilant à un ami dans une lettre de décembre 1831: «Il a avec lui une très jolie fille de seize ans qu’il va, dit-il, épouser.» Chopin et la jeune fille bavardent, Pixis revient, furieux que la jeune fille se soit permis de rester seule avec un étranger; il se calme et, craignant d’avoir offensé Chopin, il fait ensuite tout ce qu’il peut pour promouvoir ses talents, notamment une recommandation pour l’éditeur Schlesinger, ce qui aboutit directement à la commande du Grand Duo concertant sur des thèmes de Robert le diable de Meyerbeer. Par la suite, Chopin dédia à Pixis sa Fantaisie sur des airs polonais, op.13, de 1828 quand elle fut publiée en 1834. Mais la jeune fille que Chopin rencontra était-elle réellement la maîtresse de Pixis? Un musicien même à moitié célèbre aurait-il vécu si ouvertement avec une fille de seize ans et déclaré son intention de l’épouser? Ou était-ce en fait la fille qu’il avait adoptée, Franziska Göhringer (1816-?1888), que rencontra Chopin? Elle allait par la suite devenir une célèbre mezzo-soprano (sous le nom de Francilla Pixis) et faire beaucoup de tournées avec son père. Après son mariage en 1843 avec un noble sicilien, Giovanni di Sant’Onofrio del Castillo, elle quitta la scène et Peter Pixis se retira également. Quoi qu’il en soit, il semblerait qu’il n’y ait eu aucun autre événement notable dans la vie de Pixis—jusqu’à ces dernières décennies où quelques œuvres de Pixis furent enregistrées. La plus remarquable est la reprise par Howard Shelley de son Concerto pour piano en ut majeur, op.100, et de son Concertino pour piano en mi bémol majeur, op.68 (volume 58 dans la série des Concertos romantiques pour piano d’Hyperion, CDA67915, où l’on peut trouver davantage d’informations sur les rares détails connus de la vie de Pixis). L’écoute de ces deux œuvres a montré que l’oubli presque total dans lequel Pixis avait été relégué était vraiment injustifié, ce qui pourrait être confirmé encore davantage par les trois partitions enregistrées ici. Entre la fin des années 1820 et 1845, Pixis vécut à Paris où il était considéré comme l’un des plus grands pianistes de l’époque. Avoir été choisi par Liszt en même temps que Thalberg, Czerny, Chopin et Herz pour être l’un des co-auteurs de sa fantaisie l’Hexaméron était une forme de reconnaissance et une marque d’honneur. À cette époque, il y avait beaucoup d’autres pianistes éminents à Paris qui auraient pu être sollicités de la même manière, mais il faut admettre que Pixis est, en quelque sorte, à l’Hexaméron ce que Cui est au Groupe des Cinq et Louis Durey aux Six. C’est l’année de la création de l’Hexaméron (1837) que Liszt organisa un concert présentant deux trios avec piano au même programme, l’un de Beethoven, l’autre de Pixis. En raison d’une erreur dans le programme, l’ordre d’exécution des deux trios fut inversé. Le public parisien, lisant qu’il était en train d’entendre le grand Beethoven, écouta le trio de Pixis avec un plaisir manifeste et applaudit avec enthousiasme à la fin, proclamant que c’était une œuvre géniale. Vint ensuite le trio de Beethoven dont le programme annonçait qu’il s’agissait de celui de Pixis. Le public commença à donner des signes d’impatience et d’ennui et manifesta clairement ses sentiments. On peut se demander si des moyens analogues ne susciteraient pas la même réaction de nos jours dans certaines salles de concert. Quel trio avec piano de Pixis fut joué précisément en cette occasion, cela n’est pas rapporté (il en écrivit sept), mais il est tout à fait possible qu’il s’agisse du Grand Trio n° 1 en mi bémol majeur, op.75. La page de titre indique qu’il fut «composé et dédié à son ami J N Hummel», qui remarqua certainement la ressemblance entre l’écriture pianistique de son ami et la sienne, surtout dans le premier mouvement. Celui-ci commence par une figure de deux mesures entraînantes sur le plan rythmique (deux croches–demi-soupir–trois croches–demi-soupir–croche, avec reprise) qui imprègne tout le mouvement et est marquée staccato. Les mélomanes d’un certain âge y reconnaîtront sûrement la même figure qui constitue l’accompagnement de la chanson évocatrice Slow Train du duo Flanders and Swann. Mais ici elle est marquée allegro con brio et constitue un tremplin vers une succession d’idées, un passage comparable à un choral offrant un peu de répit et menant bientôt à des traits très virtuoses qui font penser au finale du quintette avec piano de Hummel (dans la même tonalité) composé en 1802. Après la reprise de l’exposition, il y a un passage de transition menant à un point d’orgue, après quoi (8'28) la figure initiale revient, cette fois en ut majeur. Pixis nous entraîne dans une brève excursion dans la tonalité de fa dièse majeur avant de revenir pour un traitement varié du matériel initial, terminant sur une scintillante coda. Au-dessus du thème simple dans le style populaire du deuxième mouvement (andante con moto), une mention notée sur la partition précise qu’il s’agit d’un «Motif de l’oracle [sic], opéra par Pixis», une œuvre sur laquelle l’auteur de cette note n’a absolument rien pu découvrir. Le thème, qui aurait très bien pu être écrit par Schubert, est suivi d’un autre dans une veine analogue avant de revenir au «Motif de l’oracle», le piano fournissant une décoration en filigrane, après quoi il tombe dans une vision plus sombre de la mélodie. Ce mouvement est en si bémol majeur. Un procédé d’une originalité saisissante nous ramène à la tonique de l’œuvre pour le finale: une section poco adagio de vingt mesures pour les trois instruments menant à une séquence en forme de cadence pour le piano seul. Les trois instruments plongent ensuite joyeusement dans le finale presto à 6/8, l’un de ces mouvements galopants et désordonnés, qui doit être aussi amusant à jouer qu’à entendre. Après une pause pour reprendre son souffle (poco adagio, 8'06), le tempo passe à prestissimo, le piano confirmant finalement sa prédominance quand les trois instruments arrivent à toute vitesse à l’exhortation finale de Pixis (il più prestissimo) qui précède une fin haletante, laissant sûrement tout sourire les instrumentistes et les auditeurs. Le Trio avec piano n° 3 en si mineur, op.95, fut publié vers 1829 et dédié «à son Ami Klengel» (très probablement le pianiste et compositeur August Klengel, 1783-1852, qui se rendit à Paris en 1828). Des octaves enflammées du piano contrastées par un motif doux—un procédé très apprécié de Beethoven—constituent le point de départ du premier sujet avant que le piano se lance dans un brillant passage en triolets sur lesquels le violon chante une longue phrase—procédé cher à Pixis. Après la reprise de l’exposition, le développement module en sol mineur et vers un thème en forme de valse, et de là en si majeur. Un jeu éblouissant du piano ramène à la tonalité d’origine pour un bref badinage avec certaines idées initiales. Si le premier mouvement appartient au piano, les deux instruments à cordes dominent le deuxième (mais le clavier reste assez actif). Le thème est un air de marche coquet (à 2/4 en sol majeur), avec un rythme pointé captivant qui apparaît dans toute la séquence des variations. Le merveilleux scherzo est écrit dans la tonalité assez éloignée de mi majeur, tout comme le trio dans lequel le piano offre un accompagnement en croches ondulantes sur de longues pédales au thème ravissant des cordes qui fait penser à Mendelssohn. Le finale de Pixis est marqué «alla Mauresque», c’est-à-dire «dans le style se rapportant aux (ou caractéristique des) Maures». C’est un mouvement de danse plein d’entrain, attrayant (et difficile sur le plan pianistique) qui ne peut manquer de remonter le moral—et aussi mauresque que le Rondo alla Turca («Marche turque») de Mozart est turc. Il conclut les quatre mouvements divertissants dans un style exubérant. La dernière œuvre proposée par le Trio Leonore est le Trio concertant n° 1 en trois mouvements dans lequel figurent des thèmes d’un opéra totalement oublié de George Onslow (1784-1853) Le Colporteur; ce trio a été écrit par Pixis conjointement avec «les frères Bohrer». Même s’il reçut un accueil assez froid de la critique lorsque de sa création à l’Opéra-Comique en 1827, Le Colporteur ou l’Enfant du bûcheron inspira plusieurs compositeurs qui utilisèrent ses thèmes, notamment Friedrich Kuhlau (Introduction et Rondo, op.98a) et Kalkbrenner (Entr’acte et Marche). Un peu comme Chopin, qui avait composé son Grand Duo pour violoncelle et piano conjointement avec son ami Franchomme, Pixis écrivit son trio en collaboration avec les frères Bohrer: Anton (1783-1852) était violoniste et connut un certain succès lors de ses tournées dans toute l’Europe avec son frère Max, violoncelliste (1785-1867). Le trio suit un modèle simple. Après l’introduction, les cordes jouent le thème sans prétention d’Onslow, suivi des deux premières variations. On perçoit d’emblée à quel point l’écriture pour les cordes est plus riche en événements que dans les deux trios avec piano où domine l’instrument à clavier. Ici, il étaye, servant principalement d’accompagnateur—ceci jusqu’à la troisième variation (3'15) où Pixis prend la suite avec quelques pages brillante. Vient ensuite la quatrième variation, très originale, où les trois instruments jouent pianissimo, le violon et le violoncelle sempre pizzicato, le piano sempre staccato. Après être passé de sol majeur pour l’introduction à ré majeur pour les variations, la musique transite brièvement par mi bémol majeur dans l’introduction à 6/8 de l’allegro final (en sol majeur); les honneurs musicaux y sont ici partagés, exemple convivial de liberté, égalité et fraternité musicales authentiques. Pixis’ riesige Nase wurde zum Gegenstand etlicher Witze. Heine schrieb: „Durch seine äußere Erscheinung, die physische, macht sich Herr Pixis noch einigermaßen geltend; er hat nämlich die größte Nase in der musikalischen Welt.“ Auch kam es zu einer denkwürdigen Begegnung mit Chopin, als der kecke junge Pole unangekündigt Pixis in Stuttgart besuchte, als dieser nicht zu Hause war. „Stell dir vor“, schrieb Chopin im Dezember 1831 vergnügt an einen Freund, „bei ihm wohnt ein sehr hübsches Mädchen von 16 Jahren, das er, wie er sagt, heiraten wird.“ Chopin unterhält sich mit dem Mädchen, Pixis kommt nach Hause und ist darüber erzürnt, dass das Mädchen es sich erlaubt, allein mit einem Fremden zu sprechen; doch schließlich beruhigt er sich. Aus Sorge, Chopin gekränkt zu haben, tut er anschließend alles zu dessen Förderung, einschließlich einer Empfehlung an den Verleger Schlesinger; sie führte direkt zum Auftrag des Grand Duo concertant sur des thèmes de Robert le diable de Meyerbeer. Später widmete Chopin Pixis seine 1828 komponierte, 1834 im Druck erschienene Fantaisie sur des airs polonais, op. 13. Doch war das Mädchen, das Chopin dort antraf, wirklich Pixis’ Geliebte? Hätte damals ein auch nur halbwegs bekannter Musiker derart offen mit einer Sechzehnjährigen zusammenleben können, unter dem Vorwand, er werde sie heiraten? Oder war es in Wirklichkeit seine Adoptivtochter Franziska Göhringer (1816-?1888), die Chopin dort antraf? Später kam sie unter dem Namen Francilla Pixis als Mezzosopranistin zu Ruhm und unternahm mit ihrem Vater weite Konzertreisen. Nach ihrer Heirat mit einem sizilianischen Adligen 1843 und ihrem anschließenden Rückzug von der Bühne setzte sich auch Pixis zur Ruhe. Wie es auch immer war, es wäre dabei geblieben—bis in den vergangenen Jahrzehnten eine Handvoll Kompositionen Pixis’ eingespielt wurden. Die vielleicht wichtigste dieser Aufnahmen ist die des Klavierkonzerts C-Dur, op. 100, und des Concertinos Es-Dur, op. 68, durch Howard Shelley (Folge 58 der Hyperion-Serie The Romantic Piano Concerto, CDA67915, in deren Booklet sich auch weitere Einzelheiten zu Pixis’ Biografie nachlesen lassen). Hört man diese beiden Werke, so erscheint es gänzlich unverdient, dass Pixis fast völlig in Vergessenheit geraten ist; die drei hier eingespielten Stücke bestätigen diesen Eindruck. Pixis wohnte von den späten 1820er-Jahren bis 1845 in Paris und galt als einer der bedeutendsten Pianisten seiner Zeit. Dass Liszt ihn neben Thalberg, Czerny, Chopin und Herz zu einem Beitrag zu seinem Hexaméron aufforderte, war ein Zeichen großer Anerkennung, denn seinerzeit lebten in Paris viele andere ausgezeichnete Pianisten, die es hätte treffen können. Doch muss man auch einräumen, dass Pixis im Kreis der Hexaméron-Komponisten etwa die Rolle spielt wie Cezar’ Kjui im „mächtigen Häuflein“ oder Louis Durey in der „Groupe des Six“. 1837, im selben Jahr, in dem das Hexaméron erstmals erklang, organisierte Liszt ein Konzert mit zwei Klaviertrios, einem von Beethoven und einem von Pixis. Wegen einer Verwechslung auf dem Programmzettel wurden die Trios allerdings in umgekehrter Reihenfolge gespielt. Das Pariser Publikum las, dass es nun den großen Beethoven hörte, lauschte dem Trio von Pixis offensichtlich mit großem Genuss, applaudierte am Ende begeistert und erklärte es zum Werk eines Genies. Dann folgte das Beethoven-Trio, auf dem Programmblatt als Werk Pixis’ bezeichnet. Das Publikum wurde unruhig, langweilte sich und zeigte das auch. Und man fragt sich, ob nicht heute in gewissen Konzertstätten eine ähnliche Reaktion zu erzielen wäre. Es ist nicht überliefert, welches Pixis-Trio bei dieser Gelegenheit erklang—er hat sieben komponiert—, doch ist es gut möglich, dass es sich um das Grand Trio Nr. 1 Es-Dur, op. 75, handelte. Der Titelseite ist zu entnehmen, es sei „composé et dedié à son ami J N Hummel“, dem zweifellos die Ähnlichkeit weiter Teile des Klaviersatzes seines Freundes mit dem eigenen aufgefallen wäre, besonders im ersten Satz. Dieser beginnt mit einer rhythmisch markanten zweitaktigen Staccato-Figur (zwei Achtelnoten, Achtelpause, drei Achtelnoten, Achtelpause, eine Achtelnote, Wiederholung), die den gesamten Satz durchzieht. Musikliebhaber eines bestimmten Alters werden sie sogleich als dieselbe Figur erkennen, die die Klavierbegleitung des alten Flanders-&-Swann-Schlagers Slow Train bildet. Hier ist sie allerdings allegro con brio bezeichnet und bildet den Ausgangspunkt einer Reihe von Themen; ein choralartiger Abschnitt bietet eine Ruhepause und mündet in hochvirtuoses Laufwerk, das an das Finale des Hummel-Klavierquintetts von 1802 erinnert. Nach der Wiederholung der Exposition führt eine Überleitung zu einer Fermate, nach der (8'28) die Startfigur erneut erklingt, nun in C-Dur. Pixis kehrt nach einem kurzen Umweg über Fis-Dur zu einer variierten Reprise in die Grundtonart zurück und lässt das Stück mit einer brillanten Coda enden. Zu dem schlichten, volksliedartigen Thema des zweiten Satzes (Andante con moto) lässt uns die Partitur wissen, es handle sich um ein „Motif de l’oracle [sic], opéra de Pixis“—ein Werk, über das der Verfasser leider nichts in Erfahrung bringen konnte. Dem Thema, das auch von Schubert hätte stammen können, folgt ein weiteres in ähnlichem Charakter, bevor das „Motif de l’oracle“ unter filigranen Umspielungen des Klaviers wiederkehrt, um sich am Ende eine etwas dunklere Gestalt zu geben. Der Satz steht in B-Dur. Zur Rückkehr in die Haupttonart wendet Pixis ein äußerst originelles Mittel an: ein zwanzigtaktiges poco adagio für alle drei Spieler mündet in eine kadenzartige Sequenz des Klaviers. Danach werfen sich alle drei fröhlich in das presto des 6/8-Finales, eines jener wild einhertobenden Sätze, die zu spielen ebensolchen Spaß machen muss wie sie zu hören. Nach einer kurzen Atempause (poco adagio, 8'06) steigert sich das Tempo zum prestissimo, und das Klavier behauptet endlich seinen Vorrang, während nach einem letzten Anfeuern des Komponisten—il più prestissimo—alles ins den atemlosen Schluss stürzt, der die Spieler sicher ebenso schmunzeln lässt wie die Hörer. Das Klaviertrio Nr. 3 h-Moll, op. 95, erschien um 1829 und ist „à son Ami Klengel“ gewidmet, wohl dem Pianisten und Komponisten August Klengel (1783-1852), der 1828 nach Paris kam. Feurige Klavieroktaven, kontrastiert von einem zarten Motiv—ein Lieblingsmittel Beethovens—bilden den Ausgangspunkt für das erste Thema, bevor das Klavier zu einem brillanten Triolenabschnitt überleitet, über dem die Violine eine weitgeschwungene Phrase anstimmt—diesmal ein Lieblingsmittel Pixis’. Nach der Expositionswiederholung moduliert die Durchführung nach g-Moll zu einem walzerartigen Thema, von dort aus nach H-Dur. Schwindelerregende Klavierpassagen leiten zurück zur Haupttonart und einem kurzen, zwanglosen Spiel mit den Anfangsthemen. Gehört der erste Satz ganz dem Klavier, so dominieren den zweiten, bei aller Tastengeschäftigkeit, die beiden Streicher. Das Thema bildet eine kokette Marschmelodie (2/4, G-Dur), von der ein punktierter Rhythmus im Ohr bleibt, der auch in der gesamten Variationenfolge erscheint. Das heitere Scherzo steht in der entfernten Tonart E-Dur, ebenso das Trio, in dem das Klavier Achtelbewegung über langen Haltetönen als Begleitung für das zauberische, an Mendelssohn erinnernde Streicherthema liefert. Sein Finale bezeichnet Pixis „alla Mauresque“, also „nach Maurenart“. Es ist ein lebhafter, freudiger und für den Pianisten anspruchsvoller Tanzsatz, der unweigerlich die Stimmung hebt—und etwa so maurisch ist wie Mozarts „alla Turca“ türkisch. Überschwänglich bildet er den Schlusspunkt des geistreichen viersätzigen Werks. An den Schluss hat das Leonore-Trio das dreisätzige Trio concertant Nr. 1 über Themen aus Le Colporteur gesetzt, einer heute vergessenen Oper George Onslows (1784-1853); Pixis schrieb es zusammen mit „les frères Bohrer“. Die Oper Le Colporteur ou l’Enfant du bûcheron (Der Hausierer oder Der Sohn des Holzfällers) wurde bei der Premiere an der Opéra-Comique 1827 zwar von der Kritik kühl aufgenommen, inspirierte aber einige Komponisten dazu, Themen daraus zu verwenden, darunter Friedrich Kuhlau (Introduction et Rondo, op. 98a) und Kalkbrenner (Entr’acte et Marche). Ähnlich wie Chopin sein Grand Duo für Cello und Klavier zusammen mit seinem Freund Franchomme geschrieben hatte, komponierte Pixis dieses Trio zusammen mit den Gebrüdern Bohrer: Anton (1783-1852) unternahm als Geiger erfolgreiche Europatourneen mit seinem Bruder, dem Cellisten Max (1785-1867). Das Trio folgt einem einfachen Muster. Nach der Einleitung spielen die Streicher Onslows anspruchsloses Thema, dem die ersten beiden Variationen folgen. Sofort fällt auf, dass die Streicherstimmen weitaus ereignisreicher und anspruchsvoller gehalten sind als in den klavierlastigen Trios. Hier liefert das Klavier vor allem die stützende Begleitung—bis zur Variation 3 (3'15), in der Pixis einige Seiten lang das Geschehen brillante übernimmt. Es folgt die originelle vierte Variation, in der alle drei Instrumente pianissimo spielen, Geige und Cello sempre pizzicato, das Klavier sempre staccato. Nach der Einleitung in G- und den Variationen in D-Dur moduliert die Musik nun kurz nach Es-Dur für die Dauer der 6/8-Einleitung des Schluss-Allegros, an dem die drei Spieler ebenbürtig Anteil haben—ein freundschaftliches Beispiel echter musikalischer liberté, égalité, fraternité.